Saffron is one of the oldest and the worlds most expensive spices, because it is harvested and processed by hand. 17 saffron flowers are needed to produce 1 gram of spice. Saffron is dried stigmas of the flower which are dark red to redish brown wiry threads. For flavour release, whole saffron threads need to be soaked in warm to hot water or in other liquids for at least 10 minutes. 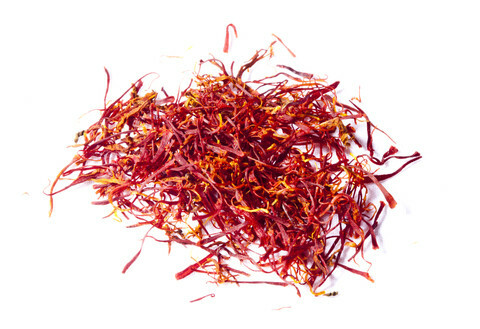 Saffron has a warm floral boquet and delicate earthy honey like taste with bitter back notes. The flavours are stronger in the organge and red varieties from India and milder in the yellow varieties from Spain. The deep red of saffron are of the best quality. Saffron contains vitamin A, B1, B2, Calcium, Sodium, Manganese, Potassium and Phosphorus. Saffron is used sparingly for colouring and flavouring foods. The threads are crushed and then infused or steeped in hot water or milk for about 20 or 30 minute for it's colour to be fully extracted. The colour infusíon is then added to foods. Saffron can be toasted dry and added directly to rice dishes. Saffron pairs well with savoury and sweet dishes such as curries, shellfish, garlic, chicken, cream sauces, soups, polenta, rices, seafood, puddings, flans, ice creams and milk shakes. Storage: If stored in an airtight container in a cool, dark place, saffron threads will keep their flavour for 2–3 years.